The Advancement Project’s Urban Peace Academy develops teams of trained professionals who will together respond to and reduce gang violence in “hot zone” communities. 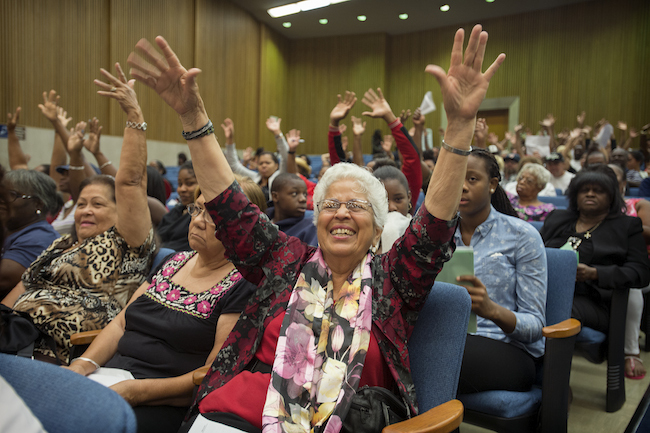 The Advancement Project’s Urban Peace Academy, which has worked to reduce gang violence in many neighborhoods throughout Los Angeles County, received the 2015 John Anson Ford Human Relations award for their efforts from the Los Angeles County Board of Supervisors. Since their founding in 2008, the academy has trained more than 2,400 individuals – many of them at-risk youths and current or former gang members – on how to negotiate gang truces, discourage retaliatory shootings, and quell rumors that lead to violence. 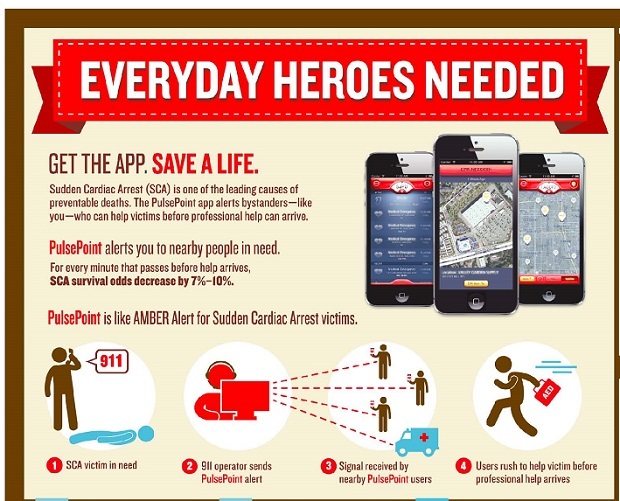 Its trained staff also works with law enforcement officers, emergency room staff, school safety personnel, and various government agencies and nonprofit organizations, resulting in improved collaboration, shared accountability for public safety, and effective community policing. Many graduates of the academy’s rigorous 14-week training course have gone on to work for the cities of Los Angeles and Long Beach’s Summer Night Lights programs, which keep parks and recreation centers open until almost midnight during the summer months. By holding sports tournaments and other activities, Summer Night Lights provides an alternative to gang involvement, as well as links to wraparound services. The academy’s innovative techniques are now being emulated by other cities in California, as well as in Columbus, Ohio; Memphis, Tennessee; and Seattle, Washington. The Board of Supervisors of Los Angeles County offers cash rewards for information which leads to the apprehension or conviction of any person responsible for committing crimes which pose a risk to the well-being of the community. In order to claim a reward, you must (1) provide information to the law enforcement agency which leads to the apprehension and conviction of the party responsible for the crime and (2) submit a claim for a reward to the Executive Office of the Board of Supervisors. In order to receive payment for a reward, the person or persons responsible for the crime must be convicted of the crime, unless the Board of Supervisors makes a finding of impossibility of conviction due to the death or incapacity of the person. On Tuesday, April 16, 2013, in front of 1734 West 151st Street in Compton, 23-year old Iyshun Dionte Tornero Bennett was with friends and family attending a birthday barbecue party. At approximately 11:52 p.m., an unknown assailant (or assailants) began shooting at the partygoers. Iyshun, along with a 15-year old male and 39-year old male, were struck by gunfire while standing in the front yard of the residence. Witnesses at the party observed that the gun shots emanated from an area located west of the party. Iyshun was transported to Harbor-UCLA Medical Center where he died from his injuries during surgery. The two remaining victims suffered non-life threatening injuries. However, the 39-year old male victim sustained significant injuries to his intestines and faces a prolonged recovery period. Iyshun Bennett is described as a former star football player at Compton High School who was preparing to pursue a career as an x-ray technician. The shock and senselessness of this tragedy has left Iyshun’s family devastated. The Los Angeles County Sheriff’s Department (LASD) detectives believe that there are witnesses in the neighborhood that may have seen the suspects leave the area.The Board of Supervisors reestablished the reward offer in this case on September 9, 2014, however, the reward offer expired on February 6, 2015. With the reestablishment of this reward offer, any individuals with information about this senseless crime are urged to contact LASD’s Homicide Bureau or Crime Stoppers. Detectives believe that a reward offer would be helpful in solving this crime, thus bringing some sense of closure and justice to Iyshun Bennett’s family and friends. Reestablish the offer of a reward in the amount of $10,000 in exchange for information leading to the arrest and conviction of the person(s) responsible for the death of 23-year old Iyshun Bennett and the injuries sustained by a 15-year old male and 39-year old male, who were struck by gunfire on April 16, 2013, in front of 1734 West 151st Street in Compton. On June 7, 2014, at approximately 12:20 a.m., on the 1400 block of W. 104th Street located in unincorporated West Athens, 38-year old Tynisa Lagail Hicks was returning home after celebrating her husband’s birthday. She was walking towards her front door when a car stopped just east of the home. Tynisa saw three black males exit their vehicle. As Tynisa’s husband Anthony entered his home, Tynisa yelled a warning, and as multiple bullets began hitting the front of the house, Anthony dove atop of the children who were sleeping on the living room floor. Tynisa was shot as she blocked the door with her body and died protecting her family. The suspects fled in a dark sedan east-bound headed towards Normandie Avenue. Tynisa worked in the medical billing field. She supported her children and monitored closely the special medical needs of her 16-year old son. She is survived by her husband and three children. Tynisa was a well-loved and respected mother, daughter, sister, neighbor, and friend. The Los Angeles County Sheriff’s Department (LASD) detectives believe that there are witnesses in the neighborhood that may have seen the suspects leave the area. Any individuals with information about this heinous crime are urged to contact the LASD’s Homicide Bureau or Crime Stoppers. Detectives believe that a reward offer would be helpful in solving this senseless crime, thus bringing some sense of closure and justice to Tynisa Hicks’ family and friends. Establish the offer of a reward in the amount of $10,000 in exchange for information leading to the apprehension and/or conviction of the person(s) responsible for the death of 38-year old Tynisa Lagail Hicks, who was fatally shot on June 7, 2014, in front of her home on the 1400 block of W. 104th Street located in unincorporated West Athens. On Tuesday, July 29, 2014, 33-year old Calvin Eugene Gray was shot and killed at approximately 8:30 p.m. on the 1000 block of West 76th Street in the Vermont Knolls community in Los Angeles. Los Angeles Police Department (LAPD) officers responded to the radio call about the shooting, and when they arrived, they found Mr. Gray in his vehicle suffering from gunshot wounds. Paramedics from the Los Angeles Fire Department responded and tragically, pronounced Mr. Gray deceased at the scene. Mr. Gray was employed by the Los Angeles County Sheriff’s Department as a Security Officer. He joined the Sheriff’s Department on October 14, 2010 and was assigned to the County Services Bureau at the time of his untimely murder. Mr. Gray was a valued member of the Sheriff’s Department and represented the County of Los Angeles to the highest professional standard while maintaining a strong moral conviction and compassion towards the public he served. Mr. Gray is survived by his three children and he leaves behind a large family comprised of multiple brothers and sisters and his 70-year old mother. In his off-hours, he was an active member of his community and church. LAPD detectives believe that there are witnesses in the neighborhood that may have seen the suspect(s) leave the area. Any individuals with information about this senseless crime are urged to contact the LAPD’s Robbery-Homicide Division. Detectives believe that a reward offer would be helpful in solving this crime, thus bringing some sense of closure and justice to Mr. Gray’s family and friends. Establish the offer of a reward in the amount of $10,000 in exchange for information leading to the apprehension and/or conviction of the person(s) responsible for the murder of Mr. Calvin Eugene Gray, who was shot and killed on July 29, 2014 at approximately 8:30 pm. on the 1000 block of West 76th Street in the Vermont Knolls community in Los Angeles. On July 31, 2013 at approximately 8:35 p.m., at the intersection of 108th Street and Western Avenue, 32-year old Jason Kennedy was shot and killed. Witnesses first observed a dark colored vehicle traveling south on Western Avenue and subsequently stop in the street. Several of the vehicle’s occupants then exited the vehicle and opened fire on several men who were walking on the sidewalk, including Jason, who was struck by the gunfire. The suspects then fled in their vehicle. The other individuals who were fired upon fled the scene and have not made themselves known to law enforcement. It is unclear if Jason was target of the attack and law enforcement officials believe that he may have been an innocent passerby – a victim of mistaken identity. Jason’s untimely death has been very difficult for his family, friends and the entire community. Jason is described as a generous and kind young man who was known for helping people, especially his elders. He had a promising future in the construction business. Jason grew up in the area of this senseless crime and his house was just steps away from where the gunfire occurred. The Los Angeles County Sheriff’s Department (Sheriff) detectives believe that there are witnesses in the neighborhood that may have seen the suspects leave the area. Any individuals with information about this heinous crime are urged to contact the Sheriff’s Homicide Bureau or Crime Stoppers. Detectives believe that a reward offer would be helpful in solving this crime, thus bringing some sense of closure and justice to Jason Kennedy’s family and friends. Establish the offer of a reward in the amount of $10,000 in exchange for information leading to the arrest and conviction of the person(s) responsible for the murder of 32-year old Jason Kennedy, who was shot and killed on July 31, 2013 at approximately 8:35 p.m., at the intersection of 108th Street and Western Avenue in the unincorporated area of Los Angeles County. On January 4, 2014, at approximately 6:30 p.m., 34-year old Tauruson McMillian was driving north on Wilmington Avenue from Rosecrans Avenue, when he was struck in the head by gunfire which caused him to lose control of his vehicle. The vehicle crashed through a backyard fence surrounding the property on the 700 block of West 139th street in the City of Compton. Mr. McMillian was pronounced dead at the scene. Mr. McMillian’s untimely death has been very difficult for his family and friends. He is described as a hardworking family man who was employed by the City of Pasadena, he was not a resident of the City of Compton, and was in the area only to check on the welfare of his friend. Law enforcement officials believe he was an innocent passerby mistaken as a gang member because of the color of his Chevrolet Monte Carlo. The Los Angeles County Sheriff’s Department (Sheriff) detectives believe there are witnesses in the neighborhood that may have seen the suspects leave the area. Any individuals with information about this heinous crime are urged to contact the Sheriff’s Homicide Bureau or Crime Stoppers. Detectives believe that a reward offer would be helpful in solving this crime, thus bringing some sense of closure and justice to Mr. McMillian’s family and friends. Establish the offer of a reward in the amount of $10,000 in exchange for information leading to the arrest and conviction of the person(s) responsible for the murder of 34-year old Tauruson McMillian, who was shot and killed on January 4, 2014 at approximately 6:30 p.m., while driving north on Wilmington Avenue from Rosecrans Avenue. On June 13, 2014 at approximately 1:18 p.m., 65-year old John Wayne Whitmore was beaten while standing on a Blue Line train platform located on the 10000 block of Willowbrook Avenue, between Imperial Highway and Wilmington Avenue. Mr. Whitmore was standing on the rail line platform waiting for a train when two females approached him. A brief verbal argument ensued between Mr. Whitmore and the suspects, who then both began beating him with their fists and kicked him severely causing him to collapse. John sustained blunt force trauma to the head; he was transported to St. Francis Hospital where he succumbed to his injury a week later on June 20. One suspect is described as an African American woman between 18-21 years of age, approximately 5’4” tall, and approximately 140 pounds, wearing a black hat, black t-shirt and long shorts. The second suspect, also an African American woman between 18-21 years of age, is approximately 5’6” tall, and 160 pounds, wearing white shorts and a white blouse. They both fled the platform on foot in an unknown direction. Mr. Whitmore is survived by a sister, two brothers and 13 nieces and nephews. He lived at his residence for 65 years and was a very talented artist. The investigators believe that a reward offer would be helpful in solving this senseless murder of pure malice, and bring closure to Mr. Whitmore’s family. Establish the offer of a reward in the amount of $10,000 in exchange for information leading to the apprehension and/or conviction of the person(s) responsible for the murder of 65-year old John Wayne Whitmore, who was beaten on June 13, 2014 at approximately 1:18 p.m., while standing on a Blue Line train platform located on the 10000 block of Willowbrook Avenue, between Imperial Highway and Wilmington Avenue, and succumbed to his injury on June 20, 2014. On May 23, 2013 at approximately 11:25 a.m., 23-year old David Matthewis was shot while walking his bicycle eastbound along the south curb on the 1000 block of Elm Street in the City of Compton. David was returning home after escorting his girlfriend to her residence. A witness reported hearing one gunshot after which David was heard screaming for help. A dark smoke-gray colored boxy sports utility vehicle was seen driving eastbound on Elm Street and out of view. First responders from the Compton Fire Department rendered aid to David, and he was transported to St. Francis Hospital where he succumbed to his injury. David is survived by his mother, stepfather, and sister. David and his family had recently moved from Long Beach to Compton. David had bright future ahead of him building custom bicycles. The investigators further believe that a reward offer would be helpful in solving this senseless crime, and bring closure to David’s family and friends. Establish the offer of a reward in the amount of $10,000 in exchange for information leading to the apprehension and/or conviction of the person(s) responsible for the murder of 23-year old David Matthewis, who was shot and killed on May 23, 2013 at approximately 11:25 a.m., while walking his bicycle eastbound along the south curb on the 1000 block of Elm Street in the City of Compton. 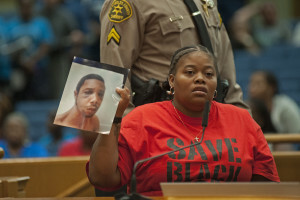 The Los Angeles County Board of Supervisors approved a request to re-establish a reward offer of $10,000, in return for information leading to the arrest and conviction of the person(s) responsible for the murder of Cedric Hurd. Cedric was shot several times in front of his daughter’s home, located in the 10900 block of Hobart Boulevard in Los Angeles. On December 18, 2001, at approximately 9:15 P.M., Cedric Hurd went to visit his 3-year old daughter, and was shot several times in front of his daughter’s home. The suspects are two black males, approximately 17 to 20 years of age (now approximately 27 to 30 years of age), and were last seen eastbound on West 109th Place in a large black sedan. On Tuesday, August 1, 2006, the Board of Supervisors approved a reward offer of $5,000, which expired on April 22, 2008. The reward offer was last extended on October 23, 2007, when the amount was increased to $10,000. The Sheriff’s Detectives from the Homicide Bureau who are working on the case are requesting that the reward be re-established. The Los Angeles County Board of Supervisor has established a $10,000 reward offer in exchange for information leading to the arrest and conviction of the person(s) responsible for the murder of Ira Tyrone Koger. Tyrone who was shot on Thursday, February 25, 2010, in front of his home in the 800 block of West Beach Avenue in the City of Inglewood. 21-year old Tyrone was preparing to leave for work and was sitting inside his car in front of his home, when a car pulled up alongside his vehicle. Ira was asked of his gang affiliation and one of the suspects shot Ira, who died at the scene from his injuries. The suspects are described as three male Hispanics with shaved heads and wore white t-shirts. They fled in a stolen 4-door white Toyota Camry. Inglewood Police Department recovered the vehicle near Centinela Park on Florence and Centinela Avenues. Ira graduated from Gardena High School in 2007, and at the time of his death, was employed at Los Angeles International Airport. He was also an active member of The Silver Lining of Hope Crusade under the direction of Pastor E. Winford Bell. He was a loving son, grandson, brother and father to his family, a wonderful friend and very engaged in his community. Ira was not a gang member and, the shock and senseless murder of Ira has left his family devastated. He is survived by his mother, grandmother, fiancée, daughter, and sister who loved him dearly. The Los Angeles County Board of Supervisors established an the offer of reward in the amount of $10,000 in exchange for information leading to the arrest and conviction of the person or persons responsible for the murder of 16-year old Thomas Riley. He was shot and killed in front of a residence located on the 1700 block of West 105th Street in unincorporated Los Angeles. At about 10:20 a.m., Thomas was standing in front of a residence, when two African-American male adults approached him on foot and one of the suspect(s) began firing a handgun in Riley’s direction. Thomas and a second minor were struck by gunfire. Both youth were transported to Harbor-UCLA Medical Center, General Hospital. Thomas Riley died as a result of his gunshot wounds. One of the suspects is described between 24 and 28 years of age, 6 feet tall, approximately 180 to 190 pounds. A second suspect is described between 18 and 20 years of age, 5.8–5.9, approximately 180 to 190 pounds. The suspect(s) fled on foot towards Western Avenue after the shooting. Thomas Riley was an upstanding young man of good moral character. Riley was not affiliated with gang members, nor had he ever been in any legal trouble. At the time of his untimely death, he was doing one of his favorite things — working with his friends on his mini-bike. The shock and senseless murder of Riley has left his family devastated. He is survived by his father and mother. The Los Angeles County Board of Supervisors is offering a $10,000-reward in exchange for information leading to the arrest and conviction of the person responsible for the hit-and-run incident that killed 26-year old Keith Conception of Los Angeles, an aspiring teacher. On Friday, February 15, 2013, Conception was on the northbound 110 Harbor Freeway, south of Florence Avenue in Los Angeles County, at approximately 3:30 a.m. According to the California Highway Patrol, he had been in a minor traffic accident and exited his car when he was struck by another vehicle. The investigation is ongoing and officials ask that any individuals with information contact Officer Christian Baldonado at (213) 744-2331. Conception, who was born in Los Angeles, graduated from Jarvis Christian College in Hawkins, Texas in 2011 with a degree in social work. He had recently returned to Los Angeles and was working as an after school counselor in the city of Inglewood. He was in the final stages of getting a job as a teacher with the Los Angeles Unified School District. Offer a reward in the amount of $10,000 in exchange for information leading to the apprehension and/or conviction of the person(s) responsible for the murder of 34-year old Charles Dejon Finch, who tragically lost his life on December 24, 2013. Listed above are the crimes in the second district for which the Board of Supervisors is offering a reward. Review the facts, if you believe you have information which could lead to the conviction of the criminal, contact the police agency or county department. 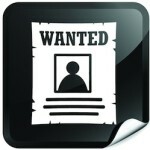 The police or agency contact can be found by linking to the reward notice from the reward listing. The police or county department must have received the information on the crime within 90 days of the reward offer, unless the time period has been extended by the Board of Supervisors. Claims for a reward must be submitted in writing to the Executive Officer of the Board of Supervisors within 60 days after the expiration of the period to provide information, unless otherwise extended by the Board of Supervisors. 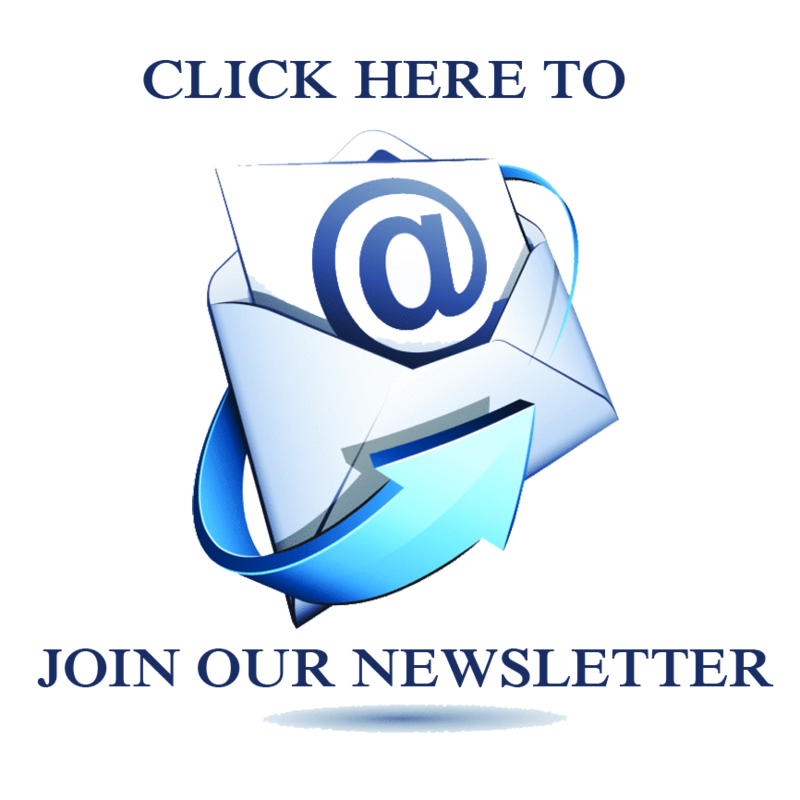 DO NOT WAIT UNTIL AN ARREST OR A CONVICTION TO SUBMIT A CLAIM! You will not be eligible for a reward if the period to submit a claim has expired. Claims for rewards must be in writing and should provide sufficient information on how to contact the claimant. A claim for a reward must state the information which led or will lead to the apprehension and conviction of the criminal. Informants may remain anonymous and such claims may be submitted through a third party such as a police agency. Anonymous claims must provide a method of contact. Any claims for rewards must be filed with the Executive Officer of the Board of Supervisors, 500 West Temple Street, Room 383 Kenneth Hahn Hall of Administration, Los Angeles, California 90012. Elvia Elizabeth Figueroa has lived through many earthquakes in her native Honduras. But as she recently visited Harbor-UCLA Medical Center in Torrance with her 8-year-old granddaughter Angie, she realized that she was not prepared for the next big one. Figueroa, who lives in Hawthorne, took advantage of the Harbor-UCLA Disaster Preparedness Fair to learn the simple steps she can take to plan for the worst. 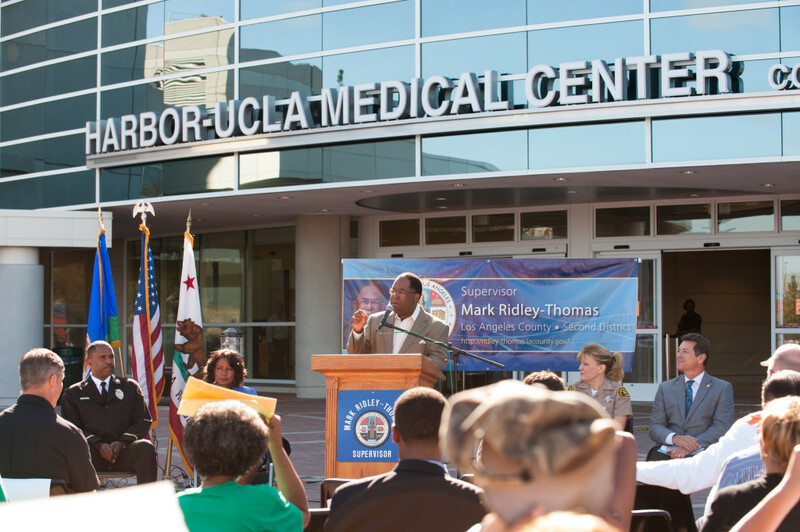 The Harbor-UCLA Disaster Preparedness Fair, part of a month-long series of events to help residents prepare for emergencies, was hosted by Los Angeles County Supervisor Mark Ridley-Thomas. More than a dozen county departments and emergency response experts were on hand to give residents emergency training, CPR training and even to answer questions about filing insurance claims in the aftermath of a natural disaster. 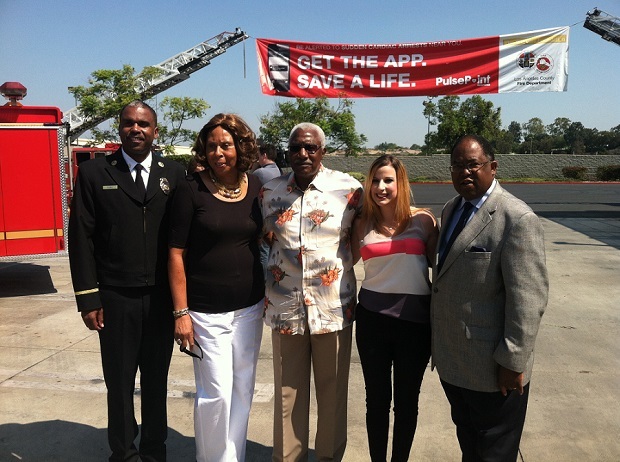 Other participants included Office of Emergency Management Director Jeff Reeb, Harbor-UCLA Administrator Delvecchio Finley, Los Angeles County Fire Chief Daryl Osby and Los Angeles County Community and Senior Services Director Cynthia Banks. Banks noted that the county’s senior centers were important hubs for residents to learn what to do in an emergency—especially learning how to text. 4. Keep a phone charger at work, home and car. As part of Los Angeles County’s Disaster Preparedness month, the county is hosting a variety of events to help residents get ready and educated about what to do. 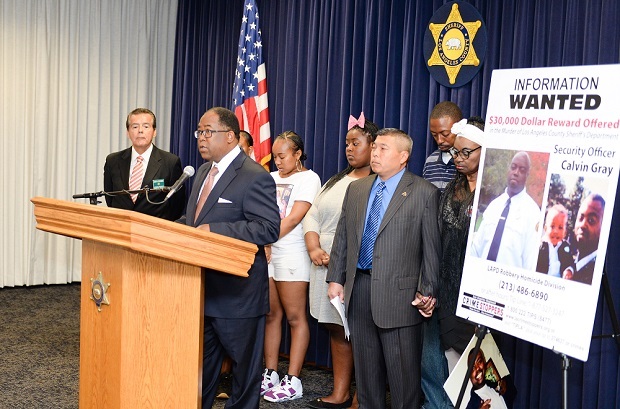 Los Angeles County Supervisor Mark Ridley-Thomas and the Professional Peace Officers Association are offering a $30,000 reward in the case of Sheriff’s Department Security Officer Calvin Gray who was shot to death in July while off duty as he dropped his son off at a relative’s home in the Vermont Knolls community of Los Angeles. Los Angeles Police Department Homicide detectives are seeking the public’s assistance in obtaining any information leading to the arrest and conviction of the persons responsible for Gray’s death. Gray was hired by the Los Angeles County Sheriff’s Department on October 10, 2010, and was assigned to the County Services Bureau. His first assignment within the Bureau was providing security at the Maravilla Senior Center in the City of Los Angeles. He worked at the Center for approximately two years before being assigned to Harbor-UCLA Medical Center in the unincorporated area of Torrance. “The Professional Peace Officers Association is offering this reward to not only to bring Calvin’s murders to justice, but also to take these violent killers off the streets so they cannot hurt other innocent souls,” said Lt. Brian Moriguchi, President of the Professional Peace Officers Association. He was known as a family man who volunteered his time mentoring children in Los Angeles. He was the youngest son born to Margaret and Bernard Gray. He leaves behind four children and a large family including four sisters and twelve brothers. Anyone with information can call LAPD Robbery Homicide Division (213) 486-6890 or the afterhours Tip Line: 1-877-527-3247. The new mental health urgent care center, which will open its doors September 2, will operate 24 hours a day, 7 days a week and will offer a variety of services including psychiatric evaluation and assessment, crisis intervention, medication support and medication management. In addition, individuals and families can receive treatment, alcohol and drug counseling and prevention, domestic violence screening and referrals to other community resources where people can seek help. 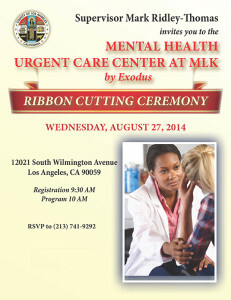 The center will be run by Exodus Recovery, Inc., which has been providing psychiatric and chemical dependency treatment services in Southern California since 1989. The organization has developed and established several hospital based inpatient and outpatient programs, a psychiatric and internal medicine provider group and a behavioral health managed care company. 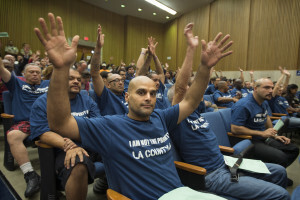 In a show of strong support for the creation of a citizen’s oversight commission, hundreds of people attended Tuesday’s board of supervisor’s meeting to demand a civilian role in reforming the department. In often moving testimony, many residents spoke of their personal experiences of abuse at the hands of deputies and urged the supervisors to create a forum where their concerns and insights could be heard. No such outlet exists today, and the newly constituted office of the inspector general is no substitute, they said. 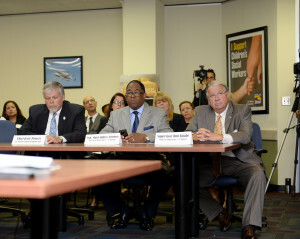 Incidents of wrongdoing by deputies and department leaders, which have only become public in recent months, some testified, had long been known to people in neighborhoods throughout the county. Greg Akili of Black Community Clergy and Labor Alliance, told the board that unwarranted shootings and abuses by deputies had created a profound lack of trust in many neighborhoods akin to the ill will that once existed between the Los Angeles Police Department and some communities. “It took many years of struggle; it took a federal consent decree to finally move the LAPD… let’s stop moving from crisis to crisis,” Akili said. Despite overwhelming testimony in favor of a commission, only Supervisors Mark Ridley-Thomas and Gloria Molina voted in favor of the motion they sponsored to create one. “No two ways about it, I am disappointed – disappointed that the board did not listen to the vote of the people,” Supervisor Ridley-Thomas said. “So yes, I’m disappointed but not disheartened. Disappointed but, may I say, undeterred. “Police commission structures exist in Oakland; Long Beach, CA; San Diego; San Francisco; New York City,” the supervisor continued, so we are not talking about something new. This isn’t a novel innovation; frankly, civilian oversight is just considered a best practice across the nation. “The people of Los Angeles County deserve to have a say with regard to their Sheriff’s Department and I am confident that they will get it. If not now, then sooner rather than later,” he said. Los Angeles County incarcerates the largest population of mentally ill people of any county in the nation. District Attorney Jackie Lacey, jail reform advocates, fiscal watchdogs, and the supervisors all have voiced concerns about the County’s inhumane and expensive system, which repeatedly cycles mentally ill people in and out of custody. The supervisors unanimously have acknowledged this circumstance, and in recent months the board has committed to exploring methods of redirecting mentally ill offenders to treatment instead of jail. At present, however, the county has set aside about $3 million. That’s not enough to make a meaningful effort at diversion. That’s why Supervisor Mark Ridley-Thomas is asking the Board to start to demonstrate its financial commitment by setting aside an amount that is the equivalent of 1% of the $2 billion already set aside for jail construction and renovations. The results from successful diversion programs across the country are encouraging. Intensive treatment lowers recidivism, resulting both in fewer new victims of crime and lower incarceration costs. In New York City, the Nathaniel Project saw a reported 70% reduction in arrests over a two-year period and Chicago’s Thresholds program resulted in an 89% reduction in arrests, an 86% reduction in jail time, and a 76% reduction in hospitalization for program participants. “It is time to stop talking about treating mentally ill people with dignity; it’s time to stop talking about taking a fiscally responsible approach to managing our jail population, it’s time to act,” the supervisor said. 1. Training for all criminal justice professionals. 2. Expanding the capacity for behavioral health treatment for mentally ill offenders. 3. Implementing a data study that examines the types of services needed, the capacity needed for those services and the population(s) most in need of these services. 4. Improving communication/coordination among all system partners to remove silos and implement a shared database. 5. Developing policies and procedures to guide service capacity utilization. 6. Creating crisis alternatives centers/crisis stabilization centers that can be utilized by law enforcement, consumers and families of consumers. 7. Expanding the availability of housing for mentally ill offenders. Embracing and investing in diversion, however, may not be just a matter of choice. Last month, the U.S. Department of Justice warned the county that its quality of care for mentally ill offenders and the high number of inmate suicides in its jails did not meet constitutional standards. The United States imprisons approximately 70,000 youths nationwide on any given day. Annually, the U.S. spends about $88,000 per juvenile—the costliest and highest youth incarceration rate in the world. So, the non-profit advocacy organization, Children’s Defense Fund, has created a model program that inspires incarcerated youths to enjoy reading and increase their self-esteem; the goal is to help them reform their lives and stay out of the justice system. The CDF Freedom Schools program, which originally began as a general school summer camp to prevent reading loss during summer vacation, came to Los Angeles County probation camps last year. Anecdotally, the program seemed successful; the joyful enthusiasm of children and their mentors was infectious even to casual onlookers. So, Supervisor Mark Ridley-Thomas, who has been an advocate and sponsor of Freedom Schools throughout his district, commissioned a study to quantify the results. Evaluators, consultants, CDF-CA staff and Second District staff conducted a total of 75 hours of informal observations at the probation camps which participated in the program. The results of the study are overwhelmingly positive: the students’ interest in reading grew, behavioral problems—including fights among the juveniles—decreased, and the relationship between staff and students improved significantly. Most importantly, the young students seemed to get the bug for learning. Supervisor Ridley-Thomas noted that the Freedom Schools program is essential in helping all of society in the long run. Click here for last year’s evaluation report. 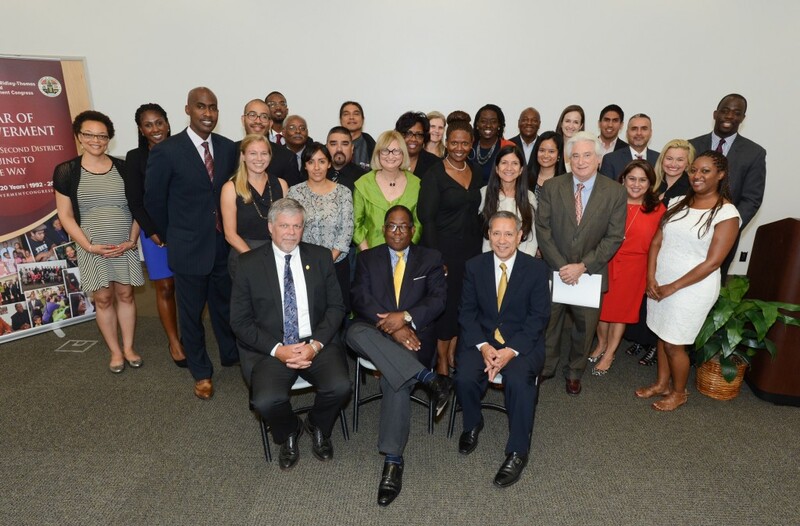 Freedom School evaluation team and community leaders during July 3, 2014 release.